This book has not had great reviews, I’d say that’s probably because the authors are defending the existence of the soul which is not a terribly popular philosophical stance these days. It’s mainly a history of the thinking about the soul presenting the arguments for the reality of a soul and the arguments against it. The structure is chronological starting iwith Plato and Aristotle and proceeding in sections to Churchland and other contemporary philosophers. The main point is to provide a basic understanding of the underpinnings of the debate and to present in that context the authors’ defense of such a view. Specifically, the book starts out with the Greeks, Plato and Aristotle and moves on to the ideas of Augustine and Aquinas. Then they get to Descartes, Malebranche and Leibniz, and moving along with Locke, Butler, Reid, Hume and Kant. The text includes appropriate chunks of text from the works of each philosopher. Then come the main themes – causation and dualism, the spacial elements of the soul and the dualist aspects of the soul. 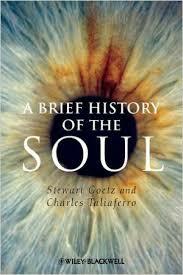 Finally, in Chapter 7 the contemporary topics are covered and in Chapter 8 some thoughts on the future of the soul. Mostly it was comprehensible but I’d be hard pressed to really explain any of the arguments to someone else. It was tough going in places – my mind wandered – I had to read some sections more than once. It is a basic (101-type) philosophy book – not a history of philosophy with little biographies of the greats padding it up.